A virtual CPU (vCPU) or virtual processor is a physical CPU core that is assigned to a virtual machine. It is the amount of processing power that a hypervisor provides to a virtual server. Even though vCPUs can be viewed as different cores, the amount of vCPU per physical CPU (or core) must be calculated. Four to eight vCPUs can usually be allocated to each physical core to accommodate varying workloads. There can be more virtual processors assigned than actual physical cores available, which allows virtual machines to share the same core. 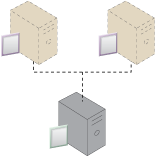 In Figure 1, a physical CPU is partitioned between two virtual machines, each with one vCPU. Converting a virtual machine from a single vCPU to multiple vCPUs requires that the guest OS be able to handle more than one CPU. This is known as a symmetric multiprocessor (SMP). Figure 1 – An example of vCPU on two virtual servers.